ABOVE: The lounge is covered by the Aru tree chandelier by Magpie. The glass coffee table stands on a piece of driftwood brought back from Namibia. This modern edge combined with something organic is echoed in the gilded mirror on the wall, still protected by its shipping crate. The home’s name, Equitania, may lead the first-time visitor to believe that all is conventionally balanced indoors, but – although the expertise of a feng shui master was called upon in designing the garden’s layout – the interiors lean more towards the exquisitely eccentric. Ornately gilded silver mirrors bring the walls to life, peeking out from behind their shipping crates that were left unremoved, while an old brown family heirloom suitcase creates a talking point in the sitting-room – that’s after discussions have been held around the fresh beetroot, oranges, turnips and pears decorating the entrance hall’s farm-style florist table. Equestrian rosettes add a playful touch to chair backs and tables, while the yellowed pages of age-old books have been stuffed into glass bowls in a quirky ode to the home’s storytelling sensibility. ABOVE LEFT: The second gilded mirror in a shipping crate stands impressively alongside the entrance-hall table. Here, the idea of ‘where farmer and florist meet’ comes to life with fresh fruit and vegetable arrangements. 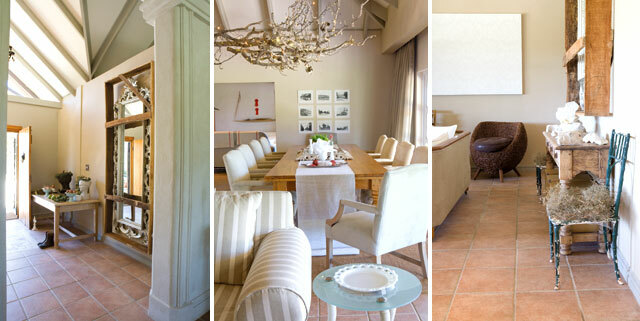 ABOVE MIDDLE: An organic chandelier by Magpie in Barrydale hovers over the dining-room table. 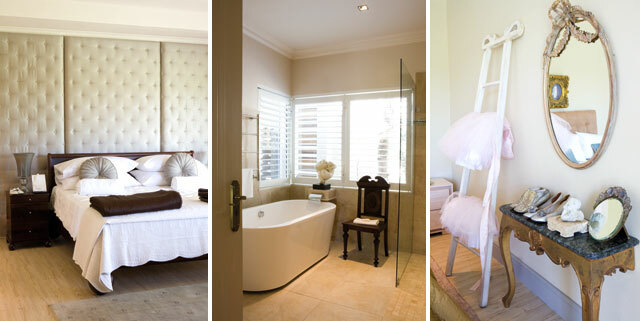 It was created from the branches of Aru trees that Esmé found in the Kalahari. The table is laid with beautiful trays and still lifes. ABOVE RIGHT: Whimsical elements, such as this old chair, add interest to the lounge area. A seat-less chair is covered with a wreath, while garden-stool cushions dress up the main bed. Then there’s the antique mirror lying flat on the dining-room table as its main centrepiece and the Moroccan carpet that’s been placed upside down to expose its raw fibres under the crate that serves as a coffee table. These stand in the same room as the drawers housing shell-holding egg containers. Oh, and let’s not forget the passage’s mirror covered in old sepia-tinted family photos – that just happens to be hanging upside down! 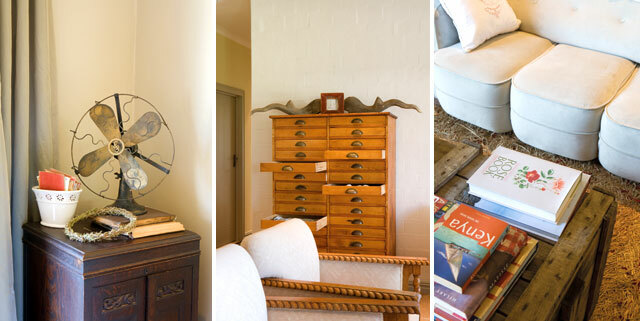 ABOVE LEFT: Esmé purchased this old fan for R70 at a junk-yard sale, showing that décor doesn’t have to be expensive. ABOVE MIDDLE: he sitting-room cabinet stands with some open drawers filled with egg containers and shells, prompting guests to open and explore the remaining drawers. ABOVE LEFT: The sitting-room coffee table is an old crate, while the Moroccan carpet has been laid upside down to reveal rougher texture. 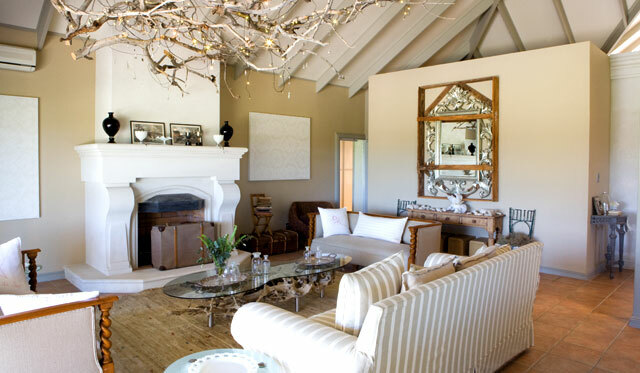 After purchasing the wine estate two years ago, Esmé began by giving the home a complete overhaul – removing an unnecessary stage window in the roof’s trusses (the remnant of a previous staircase) and in-the-way walls to create open spaces, while saying goodbye to the original yellow-pine and high-gloss finishes. The new contemporary-looking house needed to be decorated and Esmé had the luxury of being able to consolidate furnishings from three of her and Johann’s other properties into this one. Leoni casts away any idea that this was an easy task: ‘It’s easier to decorate a house if you’re shopping for everything from scratch; it’s harder to select items from the things you already have.’ Reshuffling, rearranging and restyling, the two ladies succeeded in breathing new life into old pieces while, at the same time, conducting a refreshing process of decluttering, resulting in what Esmé describes as the home’s ‘understated style’. ABOVE MIDDLE: Even the bathroom maintains the home’s honest beauty. ABOVE RIGHT: Contrary to popular belief, shoes can stand on a table! 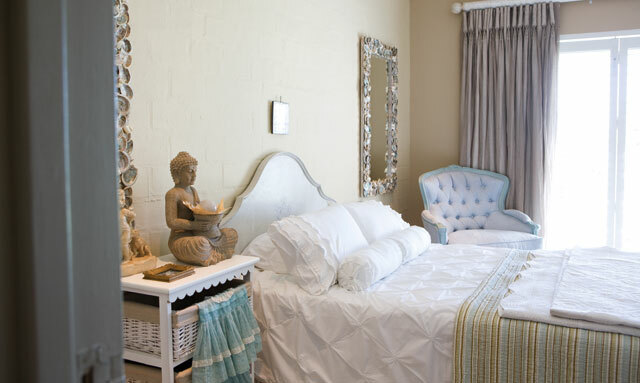 These old shoes add a touch of antiquated elegance to one of the bedrooms. Esmé, who has learned to source interesting interiors from nature, is adamant that her home should remain true to its organic nature. ‘Why should we show off the gilded mirrors?’ she asks, by way of example. ‘They would break the element of honesty – because this is not a pretentious house.’ Esmé insists on a home having soul, and its interiors being the experience of the owner and not that of someone else. The organic chandelier creating a canopy over the dining-room table and lounge tells of Esmé and Johann’s travels through the Kalahari. Aru tree branches have been transformed into a natural artpiece filled with fairy lights and shells, created by Magpie in Barrydale. Esmé values pieces that have sentimental value with stories to tell – such as the centuries-old black-and-white photographs standing to attention in glass vases. The home is blessed to be surrounded by a marvellously large space of great green lawns rolling onto the vineyards beyond. It wasn’t always so free flowing. According to Scott Hart from Magpie, the garden was previously quite stifled. While helping Esmé achieve her dream of attaining a garden that could complement the honest home, Scott and business partner Sean Daniel created a beautiful folly at one point of the garden. He also talks about the chi (energy) that was encouraged to flow into the garden. Scott admires Esmé’s passion and vision. 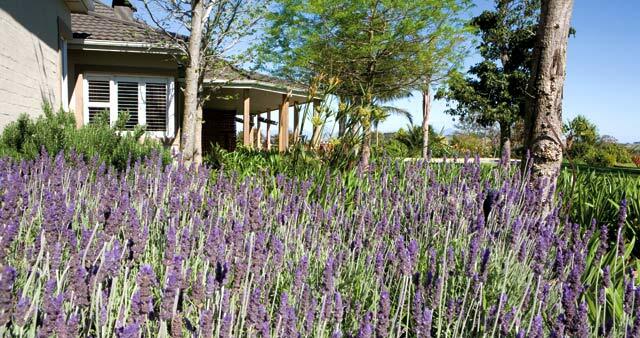 Helping her express her outdoor vision was landscaper Trudie Louw of Vroetelvingers. Once the energy fields of the house had been revealed by the feng shui master, Esmé was able to crystallise the garden’s outlines for Trudie to work with. She explains Esmé’s insistence on keeping any plant that was removed and planting it somewhere more suitable. ‘The agapanthus and gazanias were dug out and replanted in rows in front of the vines. Because they’re not high plants, they’re able to frame the view.’ When asked about working around feng shui principles, Trudie admits that it does make it easier to design a garden when starting from such a definite point. ‘It’s also fun to work with all this positive energy,’ she laughs. Balance and harmony is key in a feng shui garden. Water features encourage positive chi (energy), while symbolising prosperity and creating yin (feminine) energy. Create yang (masculine) energy by adding lights in the garden’s dark areas.